While the typical theme of New Year’s Eve is “should auld acquaintance be forgot and never thought upon” – a call to remember long standing friendships, my New Year’s Eve 2011 was, instead, an introduction to a wonderful new friend: Nebbiolo. Our tradition for New Year’s Eve is to gather with extended family, usually at our East Texas ranch, for a multicourse meal, pleasant company, a game or two and weather permitting, fireworks. This year, two of our three kids were able to join us, as were both my Mom and my sister, Kim, and her family. As my brother-in-law, Matt, is my buddy in our ISG Fundamentals of Wine class, I decided to flip-flop my usual priorities and choose the wines first and design a menu that would complement them well. We tasted a variety of French wines when we were all last together at Thanksgiving. So I decided to branch out and explore an Italian grape that I don’t have a lot of experience with, Nebbiolo. Our winery is in Tuscany and we drink a good bit of Tuscan wine: Chianti, Brunello di Montalcino, Vino Nobile di Montepulciano and Super Tuscans. I’ve tried Barolo, and we have a few in our cellar, but for all intents and purposes, I’m a Nebbiolo ingénue, in experience, if not by age. Since we covered Italian wines in our class, I’ve been eager to become better acquainted with this noble grape. I went to my favorite neighorhood wine shop, which carries a broad selection of serious wine, intending to pick up 2 different bottles of Barolo to pair with our entrée, osso bucco. I learned in my sommelier class that Barolo absolutely needs time in the bottle to soften its tannins. The Barolos on the shelf were young, most were 2007s, and I wasn’t comfortable choosing them for immediate consumption. The only other choices they had were locked inside the same display case as the Chateau Latour, and the price point, while not in the range of Latour, was higher than I generally spend . I ultimately decided to splurge (after all, it was a special occasion) on a single bottle of the 2001 Gran Bussia Barolo and to round out the tasting experience with a close cousin, a Barbaresco, that I had learned was lighter and more approachable in youth. The sommelier at the store recommended the 2005 Tenute Cisa Asinari Dei Marchesi Di Gresy Martinenga. I opened both bottles a couple of hours before I served the main course and decanted them. Matt and I put our wines class heads together and decided that we should serve the younger, lighter Barbaresco first, and follow it with the Barolo. The Barbaresco was lovely. Ruby, with bright flavors of sour cherry and subtle spices, it was round in the mouth, pleasant and easy to sip, without any trace of overbearing tannin. When we had drained the Barbaresco, we poured the much anticipated Barolo. It was truly sublime and reflected the same sour cherry character, but the Barolo was so much more complex. The sour cherry was layered with aromas and flavors of leather, tar and flowers and was velvety on the palate. I simply loved both wines. We ultimately regretted our failure to serve the Barbaresco before we began the main course. 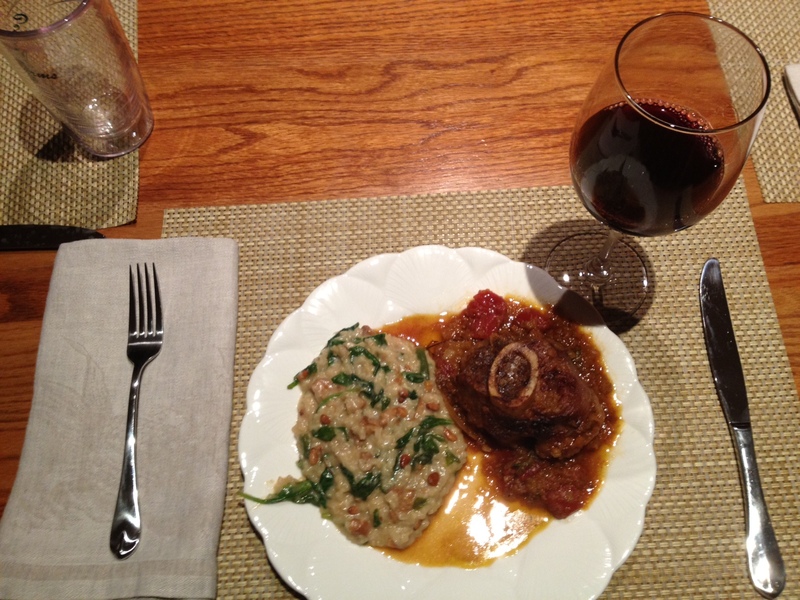 We were nigh finished with our osso bucco before we poured the Gran Bussia, and all agreed that it would have been even better with food. By comparison, we felt as though the Barbaresco would have been equally delicious, with its fresh ripe fruit and easy feel in the mouth, with or without food. 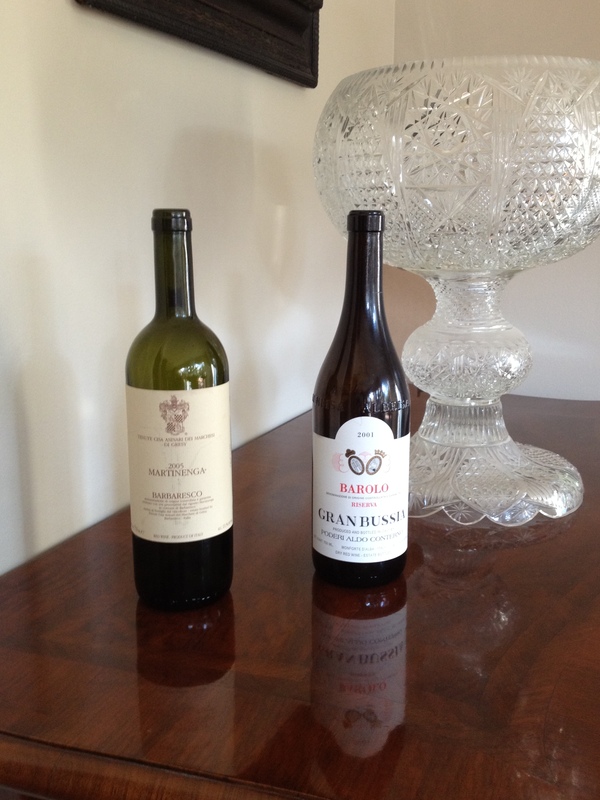 I did some research on the Gran Bussia and learned that it comes from a historic Piedmont estate, Aldo Conterno. It’s a blend of their single vineyards and is only produced in exceptional years. Unlike many Riserva wines, it is not designed to be the most powerful expression of the estate, but rather the most elegant. We certainly experienced that elegance in the glass. Bottom line, I’m highly motivated to add more Barolo and Barbaresco to our cellar, to have and enjoy through the coming decades. I’ve definitely made a new BFF, and what a great way to welcome 2012! 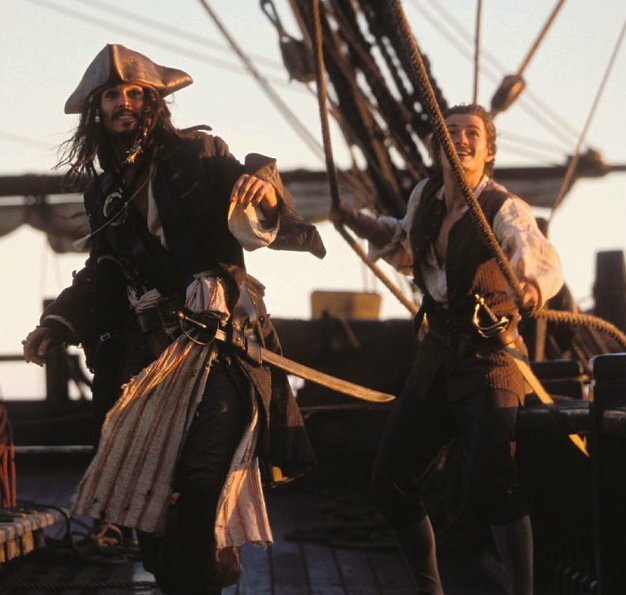 Pirate or Sommelier…..What’s the Difference? I hope 2012 brings the joy of dreams fulfilled. For the world’s 2.1 billion Christians, Christmas is a holy time of year. It is a season when we celebrate miracles and nestle in the love and goodness of God, who sent His Son to live among us. I’d like to share a deeply personal story – an account written by my obstetrician, Dr. Sam Law, shortly after the birth of my third child. I hope it reminds fellow Christians that God loves us deeply and that He is alive and actively at work in both our world and our individual lives. For non-Christians, I hope it inspires hope and an openness to question. This experience has been one of the most poignant of my life. The physical impact is obvious. It was two full years before I felt fully myself. But to me, the effects on my system of beliefs, my understanding of who I am, and my relationship with God far surpass what I experienced physically. I believe I’ve been blessed with a concrete expression of grace and I’ll never be the same. I started medical school twenty-two years ago this past summer. Over the years I have witnessed many occurrences that defied scientific explanation. I have seen women who conceived after stopping medical treatment when they had been unable to conceive with any of the myriad of infertility treatments. I have seen babies who thrived in the nursery when they were initially given little hope of survival. I have seen women who are living today when they had been given only a short time to live because of some usually fatal disease. In all of these events I have seen the hand of God rather than luck or fate. Over the last two weeks I have witnessed the most amazing occurrence of my career. It has been so amazing that I have felt compelled to share it with many people whom I have encountered. One of these was our pastor, who after hearing the story, felt as I do that God had worked a miracle in the life of this young woman. Dr. Turner asked me to share her story with you tonight. The first week of December, a young woman having her third child suffered a cardiac arrest during labor. She was sitting up in bed conversing with those around her when she described a feeling of light-headedness and her blood pressure gradually fell over a one to two minute period. When her blood pressure fell to a very low level, her heart stopped beating. Fortunately, one of the anesthesiologists was at her bedside and he immediately began resuscitation and called for emergency assistance. External heart massage and assisted ventilation were instituted within a very short time. For ten minutes there was no electrical activity in her heart. As the mother’s condition worsened the baby’s heart rate fell to about sixty beats per minute, one-half of normal. When the mother’s heart began beating again, she was taken to the operating room for an emergency cesarean section. Because there was still no measurable blood pressure, the heart massage was continued. The mother’s condition was so critical that no anesthesia could be given. She did not flinch as her abdomen was opened. The blood flow was so limited that there was very little bleeding from the operation. The baby was delivered eighteen minutes after his heart rate fell. The baby was born alive, but very depressed and was immediately placed on a respirator. He was transferred to the newborn intensive care unit in critical but stable condition. The mother’s blood pressure began to be detected about thirty minutes after her arrest. As her condition improved, she began to hemorrhage from the site of the operation. It was believed that the only disease that could cause this dramatic picture was an amniotic fluid embolus. This disease is very rare occurring in an estimated one in 100,000 deliveries or fewer. The disease is about 80% fatal, and if a patient recovers, the diagnosis is always questioned. A feature of this condition is a severe blood clotting abnormality. Because of the large blood loss, blood transfusions were started in the operating room during the surgery. After two hours of surgery, the bleeding was controlled adequately to transfer the young woman to the surgical intensive care unit. She was comatose. She was still requiring the respirator. She was receiving medication to stimulate her heart and her blood pressure. She was continuing to receive blood to control the blood loss from her surgery which was continuing. Since that time her recovery has been rapid. She left the ICU on the sixth day and was discharged from the hospital to her home on the ninth day. Her baby seems completely normal. She is receiving some physical therapy for a weakness in her left arm, and also some speech therapy. This patient’s story spread through the hospital staff like no other in recent memory. The reactions have varied. Some skeptics have said that she must not have really been as sick as she seemed to be. But those who cared for her know that that is not true. Other individuals have said that she was lucky. Luck may be responsible for winning the lottery or a football game, but it seems to be unrelated to these events. Most people have praised the doctors or modern medical science. While I do not want to discount the quality or importance of the care that she received, none of the medical team involved in her care can relate what he did to achieve this amazing result. I believe that the medical team were instruments in the hand of God providing a framework for Him to perform a miraculous healing in the lives of this young woman and her newborn child. It’s week nine of our ISG Fundamentals of Wine class and it’s a whirlwind. We took our test on Europe – an essay on the wines of Italy, Spain, Portugal, Germany, Austria and Hungary and we studied the entire “New World” of wines: The United States, Canada, Chile, Argentina, Australia, New Zealand and South Africa, all in a single class. Our classes are seven hours in duration, but it still felt like I had been bulldozed by information. I found it interesting that the wines of Europe merited twenty eight hours of class time and that the entire rest of the world, by comparison, only merited seven. Living in Texas, I drink more California wine than anything else. We travel to Napa annually and through the years have developed relationships with many vineyard owners and winemakers, whose wines often stack up very well in both the ratings and international competition. But I’ve learned some interesting facts these past weeks: France and Italy are perennially the top two producers of wine by volume, though in recent years, they have oscillated between those first and second slots. Spain has more land under vine than any other country, but is the third largest producer of wine by volume, both because of lower yields per vine due to their low annual rainfall as well as allocation of grapes to their significant brandy industry. The United States is the world’s fourth largest producer, and interestingly, while wine is now produced in each of the fifty states, California, on its own, is also the fourth largest producer globally. And though when I think of California wine, the Napa Valley is what immediately springs to my mind, only 4% of California’s wine is produced in the Napa Valley. In 2009, France, Italy, and Spain produced a combined 13.15 million liters of wine. By comparison, the United States, Canada, Australia, New Zealand, Argentina, Chile and South Africa produced a combined 7.17 million liters. [i] So when I put all the numbers in perspective, I understand the allotment of class time. I’m also very excited that the class has provided a global perspective and I’m thrilled to be actively engaged in the exploration of European wines beyond Bordeaux and Italy where I’ve concentrated my interest and experience to date. As to the test, it went very well. We reviewed the material last week and the Spanish and Portuguese regions, and their wine and food, which we were asked to compare were covered in our review session. Again, I over prepared. For this test, I made a twenty-one page outline of the covered material and spent about twelve hours preparing. I was very comfortable with my level of mastery. Unlike the 8/10 that I earned on the test on France, I expect at least nine points on the test on Europe. At this point, I’m very confident that I can do very well on the academic portions of the test, but my stress level about those four blind tastings, which I am required to pass independently from the academic exam, is rising rapidly. How I’d love a “decision tree” to help prepare for the tastings. By “decision tree”, I mean a chart that starts with color and eliminates certain possibilities. Then, from the remaining options, uses the acid, tannin, alcohol profile to eliminate additional possibilities. Then, from those remaining options, uses aroma and palate markers to indicate the identity of the wine. So now for the song….”All I want for Christmas is a decision tree, a decision tree, a decision tree……” Merry Christmas, and Santa, I’ve been a really good girl this year. It’s week 7 of my ISG Sommelier Class. We completed our study of Europe and studied and tasted the wines of Spain, Germany, Austria and Hungary. We also took the first part of our final exam – an essay on the wines of France. We are in Part II of our Fundamentals of Wine class and our final has three parts: 100 multiple choice questions, six essays and four blind tastings. Two of the essays are taken mid-course: one on the wines of France and a second on the wines of Europe. The remaining four will be part of the overall test on the last day of class. I find the amount of information on French wines, even in our introductory level class, staggering. I made detailed spreadsheets, comparing regions and sub-regions which totaled more than twenty pages. All in all, I spent fifteen to twenty hours preparing and felt as though I had reached a high level of mastery, if I add the caveat that I’m only talking about the material we actually covered in our textbook and class . It turned out that the essay question was easy and that my zealous preparation actually hurt me. I was so focused on the minutia that I made a careless error regarding material I knew well which cost me 1-2 points out of ten. I’m a bit of an over-achiever by personality and I was so frustrated with myself!!!! I had worked so hard and with the time limit, just didn’t catch my error in time. Still, I don’t regret all the studying. If I’m serious about my quest to become a “wine-expert” it was work that had to be done. I like the two-phase approach to the exam. After experiencing the multiple choice test for Fundamentals of Wine I, and the essay on the most complex region, I feel very confident about the academic portion. The only uncertainty that remains is those blind tastings…. We had a blind tasting for Fundamentals I, but it was a New Zealand Sauvignon Blanc, a wine that has strong, distinctive flavors and aromas. On top of that, I enjoy Sauvignon Blanc and in our hot Texas summers drink it often and and know it well. I’m very concerned about my ability to identify many of the other varieties we have tasted. Most of the time, my tasting notes seem to be largely on point when we discuss the wines in class. I’d tend to put myself somewhere in the middle of the group in terms of what I am generally able to distinguish in a particular wine. My brother-in-law, Matt, who’s one of my buddies in the class, and I enviously joke about one of our classmates, Stephen. We call him “the Savant” because he nails the tastings, with humble eloquence, each and every time. Stephen’s a great guy. We just wish we had his educated and perceptive nose. Our teacher has mentioned that the blind tastings are graded on a point by point basis and that if we correctly note appearance, aroma and palate descriptors, that we can still pass, even if we’re clueless in identifying the grape, country or region, at least for this class. So while I’m not yet a savant like Stephen, I’m confident in my ability to do well and qualify to advance. Better yet, I love what I’m learning and that’s the real point now, isn’t it? My sister Kim’s husband, Matt, and I are taking our ISG sommelier class together. As we’ve been studying French wine, we opted for a French wine tasting with our annual Stinky Cheese Feast over the Thanksgiving holiday. We agreed to each choose a red and white to contribute to the occasion. But first some history on the Stinky Cheese Feast. 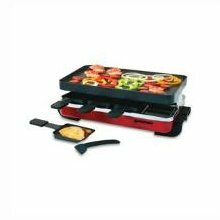 When I was growing up, a friend of my mother’s was living in Switzerland and gave my mother a Raclette grill as a Christmas gift. Raclette is a Swiss cheese that is melted, either in front of a fire of on a grill like the one we were given, then scraped onto plates. It is traditionally served with boiled red potatoes, gherkins and dried meats. It was the 1970’s in suburban America. To us, “gourmet” cheese was just about anything that was wasn’t pre-sliced and individually wrapped. To Kim and me, Raclette was exotic, foreign and sophisticated. In other words – we loved it. Besides, what’s not to love about gooey melted cheese on crusty bread? Kim and I each have Raclette grills now and it is a great way to enjoy an evening with family and friends. There’s something just very homey about sitting at the table and “cooking” as you eat – it promotes conversation and it’s pleasant to linger at the table. Matt is a very witty man and no time with him is ever boring. Not long after he and Kim were married, he dubbed Raclette “Stinky Cheese”. The moniker stuck and the Stinky Cheese Feast was born. Our respective groups of friends look forward to our winter Stinky Cheese Parties. They are, without exception, a big hit. For the wines, I have been interested in learning more about Burgundy, so I chose a Chanson Pere et Fils Puligny-Montrachet, a Domaine Anne et Herve Sigaut Chambolle-Musigny and a Domaine des Beaumont Cherbaudes Gevrey-Chambertin. Matt loves the southern Rhone and chose a Domaine Giraud Chateauneuf-Du-Pape and Chateau de Fouilloux Chateauneuf-Du-Pape Blanc. We started with the Puligny-Montrachet as it was chilled and the white Chateauneuf was a bit warm. We found this Chardonnay delicate and wonderful, with floral and lemon aromas and a hint of vanilla. ButI think we should have shown some patience and waited for the white Chateauneuf to chill. It just didn’t show well following the Puligny-Montrachet. We learned in our class that white Chateauneufs are fairly rare and are not inexpensive. [i] After the freshness of the Chardonnay, the white Chateauneuf tasted heavy, almost a bit syrupy. We rejected the bottle, Matt even poured his into the sink, and decided to move on. Out of curiosity the next afternoon, I pulled the bottle out of the refrigerator and re-tasted. It had not been sealed well, so its condition wasn’t optimal. But with my fresh palate, it was much improved over the day before with scents and flavors of honey, marmalade and spices. It wasn’t my personal favorite, but we truly did the wine a disservice the evening before and I would be willing to try one again. The next bottle that we opened was the Giraud. Unlike the Chateauneuf Blanc, it was very nice: warm and juicy with aromas of stewed figs, raspberries and dark earthy spice. I loved the wine, but to me, it didn’t go that well with the cheese. In my mind, I think it would have been wonderful with roasted meat or a savory stew. I thought it overpowered the Raclette. 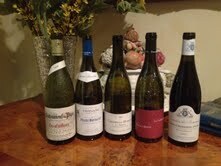 The Burgundies were also a bit of a disappointment, but for very different reasons. Matt opened the Gevrey-Chambertin and the top edges of the cork were edged in “wine tar”. We discussed the issue. Neither of us had ever seen “wine tar” before, but we knew it wasn’t normal and guessed that it wasn’t good. We decided not to open it and ask Karla, our sommelier school teacher, if we should return it. I showed her the photo of the cork and she said that the wine had probably been exposed to heat in transit and that we were wise not to open it. So while it was a disappointment not to taste it, we have $100 to try again another day. The Chambolle-Musigny, on the other hand was very nice. Our textbook uses words like “feminine”, “floral” and “elegant” to describe these wines. I haven’t tasted many Burgundies, but we drink a lot of Oregon, California and New Zealand Pinot Noir. It was certainly softer, and more subtle than its new World counterparts. It smelled of red fruits with a soft minerality, and think it was even lighter in color than I generally expect. Other than those basic observations, we didn’t really slow down to analyze it. It was the fourth bottle, and we had abandoned our student critic personas and had slipped into that realm of relaxed candlelit conversation amongst friends. Did we increase our knowledge of French wine exponentially? No. But it was a grand evening- as always, a Stinky Cheese Feast to remember. Weeks 5 and 6 of my ISG sommelier class have been both exciting and a bit intimidating. We’ve shifted our focus from grapes to wine regions and started off with what I perceive to be the most complex: France. I’ve been looking forward to these lessons because French wines are viewed by many (as prices confirm) to be the pinnacle of the wine market pyramid. I’ve always found navigating the myriad of French wine choices a bit like the card game “Concentration” where you turn over a random pair of cards, blithely hoping for a match. I haven’t understood the labeling, especially in Burgundy, and have relied on a combination of wine reviews and a process of trial and error to find wines I like. Too many times, I’ve paid too much for wines I enjoyed too little. I’m ready to become an educated French wine consumer. Tasting the wines has been great. For our class, our teacher selects an array of wines that reflect regional, style and quality differences. Tasting the wines and discussing them together has been helpful. There have been several that I’ve really enjoyed, and all are at moderate price points. I’m starting to develop a sense, although more slowly than I would like, about what I can expect based on the wine’s label: the constituent grapes, the potential of the vineyard to produce excellent wine, and the winemaking style. I’m learning that I tend to prefer right bank Bordeaux over left, which surprises me because I generally prefer California Cabernet Sauvignon to Merlot. And I’m learning to appreciate the subtlety and elegance of one of my favorite grapes, Pinot Noir, as I gain a touch of confidence with Burgundy. As I struggle with the memorization, I’m reminded how the lessons and experiences of life ebb and flow; how the things that I focus on change and various disciplines fade into the background for a time, only to reemerge with a relevancy that I never anticipated. I studied French in both high school and college and spent a summer as a student at a language branch of the University of Poitiers in Royan. But that was more than twenty-five years ago and since that time, I’ve viewed those years and that effort as a largely closed chapter. Except for the relative ease that I’ve experienced in learning my second Romance language, Italian, French simply hasn’t seemed relevant in my day to day world. However, as I discover that French wine is a lot like commercial real estate and that it’s all about “location, location, location”, my knowledge of French, as rusty and intermingled with Italian as it has become, has suddenly become a hidden treasure. Place names, and terms of art relating to wine law and winemaking spring to life and I find that my interest in the French language has resurged and that I want to become truly trilingual. Similarly, I recall so easily the disdain that I felt in school when I was required to memorize country names and capitals on faraway continents. In the 1970’s, air travel was true luxury and while my childhood family always had a gypsy bent, we almost always toured by car. By best count, I visited more than half of the fifty states before my 18th birthday, all in the back of our family’s station wagon. Since that time, Jay and I have developed a real fervor for travel. Together, we’ve visited all 7 continents and 47 countries. Many times in our sommelier class, Karla, our teacher, asks “Has anyone been here?” “What was it like?” “What did they eat?” “What did the landscapes look like?” I’ve visited almost all of the world’s major wine producing areas and it’s so helpful to have an experiential anchor – a mental image to make the endless array of countries, regions, districts and villages, which provides important context for wine, real and logical. I’m enjoying this season of life when so many elements of past experience come together to facilitate a long-term passion. Wine and Onion: More in Common than You May Think….. This week marked the end of our ISG Fundamentals of Wine I class and the beginning of Fundamentals of Wine II. From a certain perspective, it seems strange that the class is divided into two parts. On the other hand, it’s beginning to make perfect sense. First, the focus of the first four weeks was grapes, and we studied and tasted 18 different varieties. In most cases, we tasted both Old World and New World examples, as well as wines that demonstrated different methods of vinification so that we could begin to really know the grapes and to hopefully recognize them, in all their many faces. The focus of Fundamentals of Wine II will be to study wines from specific regions, to learn about terroir, climate, culture, viticulture and vinification practices so that we can begin to understand how those influences work together on our friends from Fundamentals I, the grapes, to produce treasure in a bottle. So while the emphasis of Fundamentals II is different from that of Fundamentals I, I got the sense this week that we are just starting the downward spiral at the wide top end of a never ending funnel of learning. The study of wine is like an onion and there are many layers of understanding. 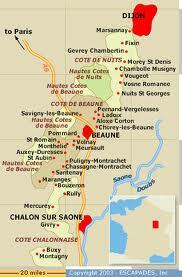 This week our focus of study was the wines of France. I’ve been waiting for the week with excited anticipation. As an American consumer, I’ve always felt undereducated about French wines. I’m accustomed to labels that tell me what’s inside the bottle and French labels that merely reveal the place of origin often perplex me. As I read our book and prepared my spreadsheet to condense and organize what I’ve learned, I just kept thinking about a photo that I saw earlier this summer. 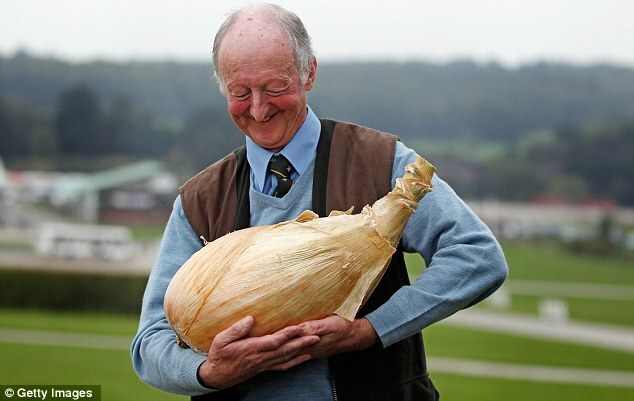 In the photo, an English pensioner lovingly cradles his world record onion like a mother with her newborn. Peter Glazebrook’s monster onion weighed in at 17 lbs., 15.5 oz. As I look at my spreadsheet of salient details on just Bordeaux and Burgundy and realize that it’s already 14 pages long, I reach an inescapable conclusion: Wine is one big “onion”……. And as onion plays a starring role in all the world’s great cuisines, to me, wine plays a starring role in meals, adding nuances of texture and flavor and inviting friends and family to explore, share and linger, basking in the comfort of togetherness at table. The smile on Mr. Glazebrook’s face says it all. 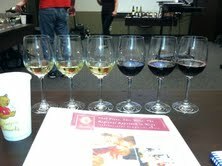 It’s week four of my ISG Fundamentals of wine class. I have been very eager for this week’s class because we studied and tasted Sangiovese, Nebbiolo, Syrah, Grenache and Tempranillo. As Sangiovese is the primary grape in Chianti, and I own a vineyard in Chianti, I really need to learn as much as I can about Sangiovese. If I had tried to imagine in my twenties what my life might look like in my forties, I would have never even considered that I would have started a winery in a foreign country and that instead of practicing law, I’d be spending my time going to sommelier school and learning Italian. Every time I think about how we were first drawn to Italy, it just makes me smile. I had an amniotic fluid embolis while delivering our third child in 1994. It’s a long and detailed story, but my son and I are walking miracles. He was delivered by emergency C-section 27 minutes after my heart stopped beating. Needless to say, I had a very long and difficult recovery. We celebrated our 10th wedding anniversary in the spring of 1996. My doctors were trying to treat some lingering stroke like symptoms that I was having and I was heavily medicated. My precious in-laws gave us tickets to Europe and we were thrilled to try and forget about my health challenges for a couple of weeks and explore Italy. Due to the high levels of medication, my memories of our trip are a little hazy. 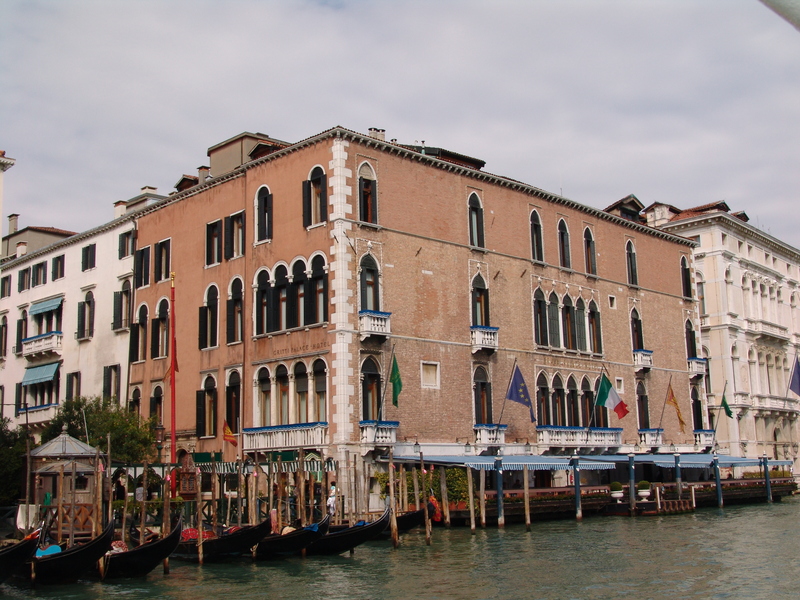 We started our adventure at the Gritti Palace in Venice and blissfully reveled in history, ambiance and romance. We drank Kir Royales in the Piazzo San Marco, wandered aimlessly through the Murano glass shops, picnicked on a gondola and tried squid ink risotto. It was magic. Then we took the train to Florence, checked into the Helvetia and Bristol and let the magic continue. We toured the Uffizi and Accademia, strolled leisurely through the Boboli Gardens, and ate enough gelato to make a beanpole fat. Even in my medicated daze, I recall how it felt to walk the streets of old Florence. I’m a history buff and in Florence, you just breathe it in and a sense of timelessness and raw antiquity sinks deep into your bones. I remember standing on the Ponte Amerigo Vespucci and wondering what it must have been like in centuries past – the boats that would have been floating by while cavaliers in renaissance cloaks galloped over the bridge on urgent Medici business. But my favorite part was when we rented a car and drove south throughout Tuscany. We stayed at inns and bed and breakfasts – all recommended by one of my favorite guidebooks on Italy: Karen Brown’s Charming Inns & Itineraries. I can’t say enough good things about her book. She does an amazing job recommending places that allow you to really sink into the ambiance of Italy. I loved exploring the hamlets of Chianti Classico, climbing the towers of San Gimignano, enjoying pizza and people watching on the Piazza del Campo in Siena, sipping a beautiful bottle of Brunello al fresco in Montalcino and breathing in the salty seaside scents of Forte dei Marmi. But my most vivid memory is of a picnic on the side of one of those perilously windy roads in Chianti. There’s something very romantic, even a touch ethereal to me, about picnicking in foreign countries. I love the process of gathering local fare, and choosing a spot. Gathering fare in Italy was interesting, because of the bounty of the yet undiscovered. Italians have knack for curing meat and we snacked on Bresaola, Prosciutto di Parma, Prosciutto Cotto and Mortadella. And the cheese…..how can I even put words to the sensation that I felt the first time Gorgonzola touched my lips? Bravissimo, delizioso, straordinario!! While I didn’t speak Italian at the time, I now understand that the delights of Italian cuisine are best reflected in their native tongue. The flavors married perfectly with the superb bottle of Super Tuscan that a young vintner gave us out of kindness because he had sold his full inventory of highly rated wine and could not legally sell us a bottle (again, another story for another time). While gazing over vistas that are hard to match on this side of heaven, we feasted, in both body and soul. It was one of those instances in life, rare but wonderful, when the ambiance was literally palpable. As untrue as it may sound, I knew in my gut that I somehow belonged there, that it felt in some unexplainable way like home. Since that time, I’ve been aspiring to become Italian. Please don’t misunderstand, I’m proud to be an American and wouldn’t trade my homeland or family for the world, but I’ve been intrinsically drawn to that boot on the Mediterranean ever since. Since that trip, we’ve progressively taken baby steps toward creating a life there, at least part time. It’s still a work in progress – and that journey itself is part of the fun.